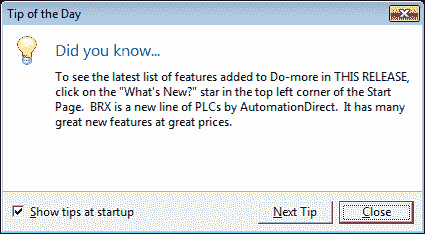 The BRX PLC uses the Do-More Designer software which can be downloaded free of charge and includes a simulator. 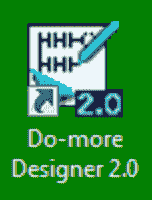 The latest Do-More Designer software version is 2.0.3. 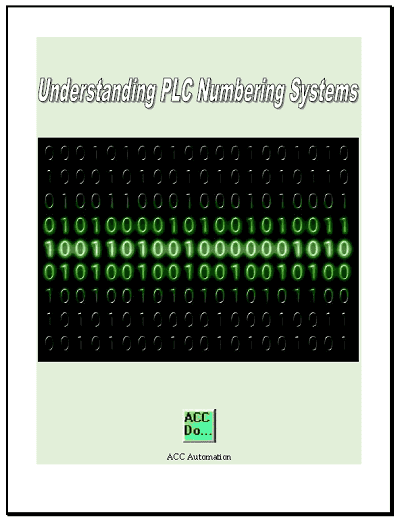 This is the same software that we used in the Learn PLC Programming Fee Video Series. 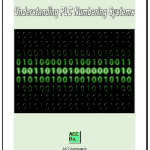 The Do-More Designer software can be used to program the whole series of programmable logic controllers. 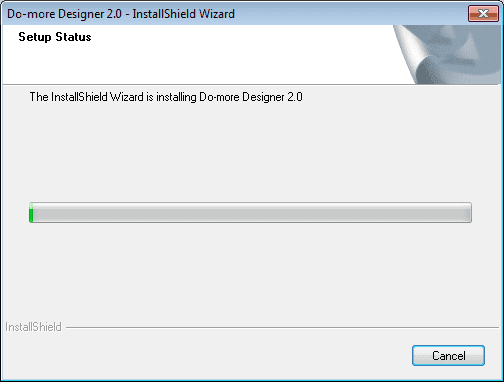 We will be installing and reviewing the Do-More Designer software version 2.0.3. Version 2 is mainly to accommodate the new BRX Series PLC. 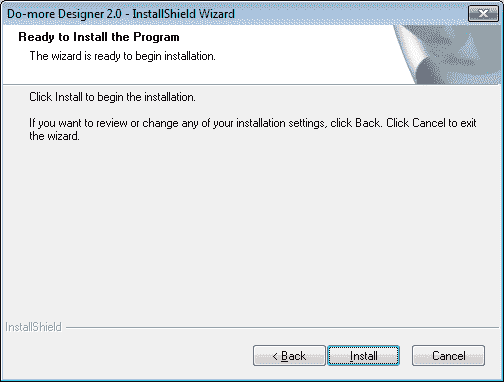 The first thing to do before installing the software is to ensure that your computer can install this software. 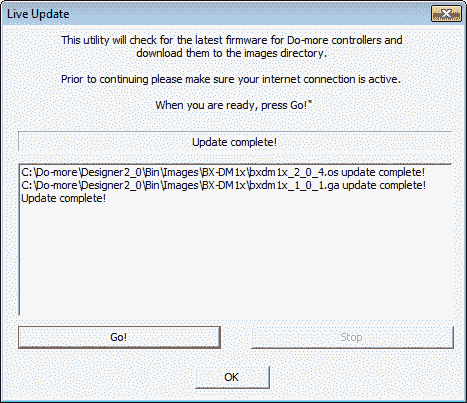 Here are the basic specifications that you need to install the Do-More Designer software. You will see that the software is not very taxing on any system. 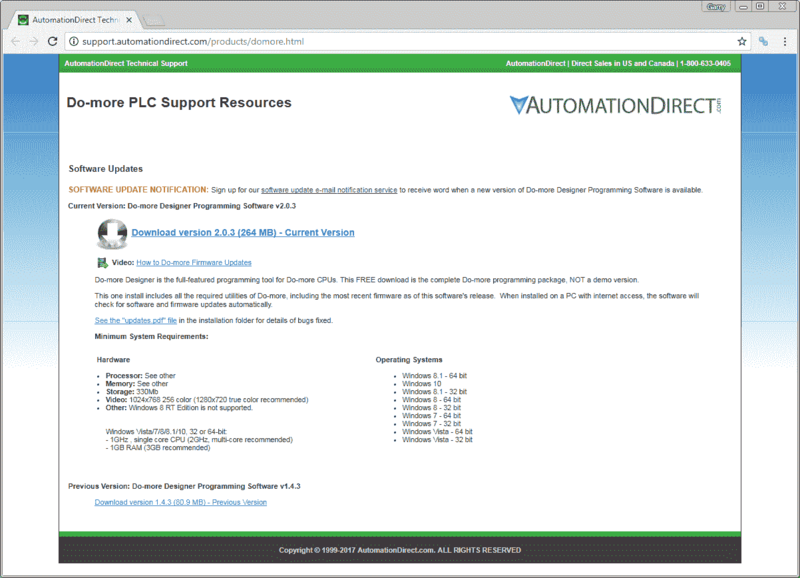 The above link is the location on Automation Directs website that you can download the software. While you are on the page, you can also sign up to get notification each time there is an update for the software. This way you will always have the latest software or at least know about it. The downloaded file is a zipped file. 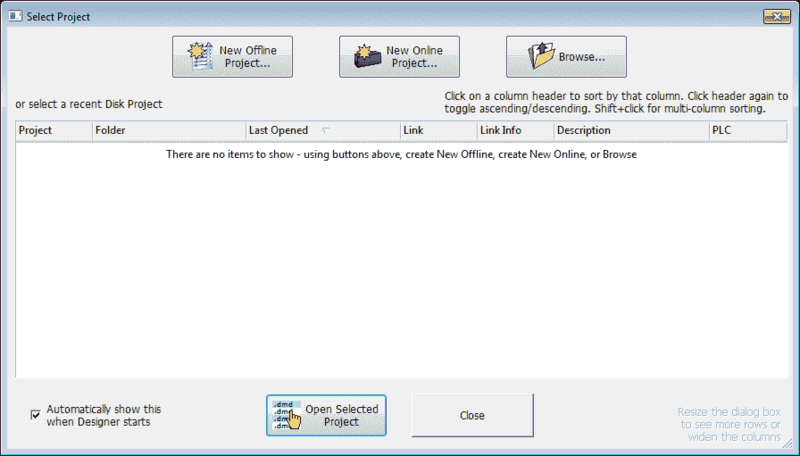 (domore_v203.zip) Using explorer find the downloaded file, right click on the file and select “Extract All”. This will unzip the file so we can then install. The extracted folder will contain two files as you can see above. Double click the SetupDmD_R2_0_3_Production.exe file in the downloaded, uncompressed folder. This will start the installation process. The license agreement window will appear next. 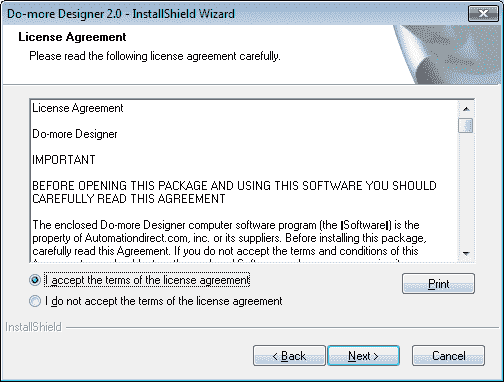 You must accept the terms of the license agreement to install the program. Hit Next. Customer information window will now appear. You can enter your name and company name. Hit Next. 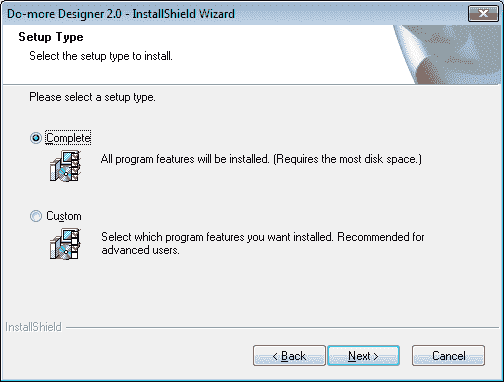 The setup window will allow you to customize the installation of the software. 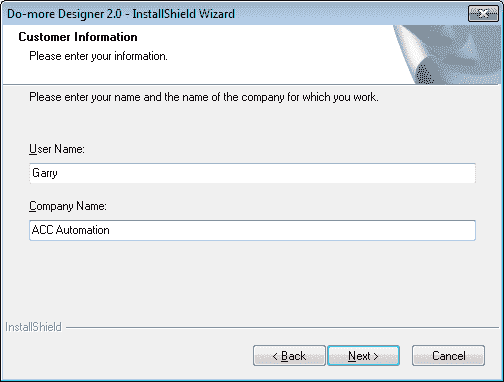 You could specify the location that the software will install and what parts to install. We will do a ‘Complete’ installation. Hit Next. Ready to install the program will now be displayed. At this point you can change any of your previous selections before the installation by hitting the ‘Back’ button. 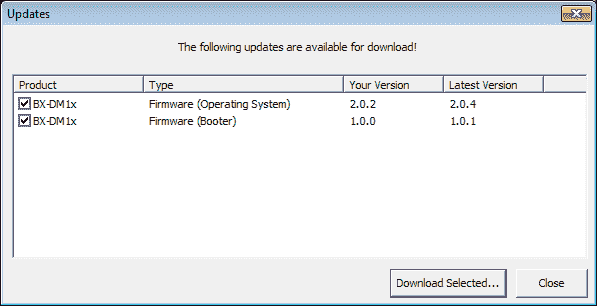 If everything is correct, hit the Install button. You will be asked if you want a shortcut on your desktop. I usually answer yes because you can always delete the shortcut latter if it is not required. Hit Yes. Improvements in the software generally happen by reviewing the items that people get stuck on the most. By allowing Do-More Designer to log general usage information this will aid in better features of the software. Hit Yes. The software will now install. You can hit cancel at any time to stop the process. Notification will be given once the software has been installed successfully. You can decide if you want to read the Read Me file and/or take a survey. Hit the Finish button to end the installation. You will now have an Icon on your desktop to start the software. When you first start the software you will enable the Do-More Communication Server. This will appear before the program loads. The Live Update window will now display. Pressing Go! will download and update the software. When the updates are complete you can then hit OK. The tip of the day will be on by default. I like to read these tips each time that the software starts. There are always some tips that I have not used before which makes the software easier to use. You can review several tips by hitting ‘Next Tip’. Hit Close when you are done. The select project window will now display. This will show you the last projects that you have worked on. Starting a new project or continuing a previous one is easy with this quick menu. You may uncheck this feature by the bottom left corner. I prefer to use this because it is quicker then using the menus to get to the last project. Since we have no projects yet, this is blank. Hit Close. This is the main menu of the program. 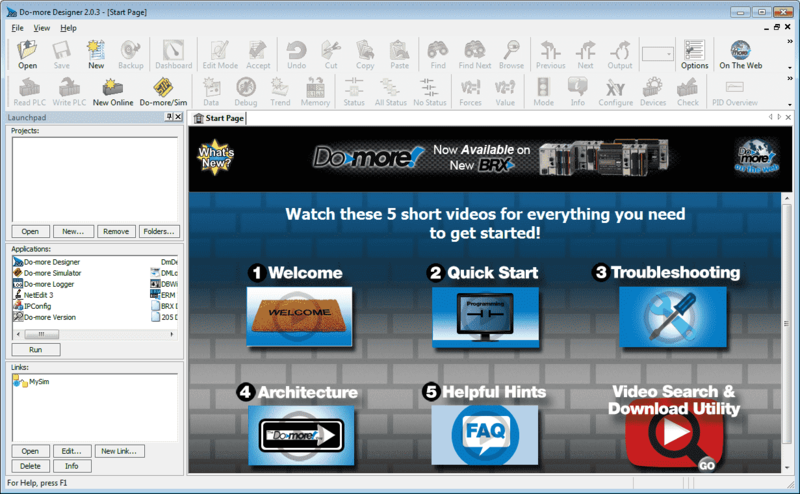 The five short videos will help you get started with the Do-More Designer 2.0 software. 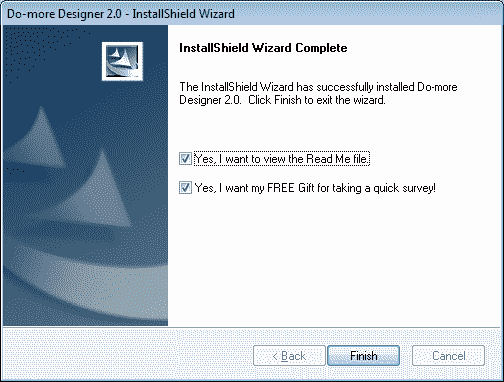 The installation and update of the software is a very straight forward process. You can watch the video below to watch the installation process. Next time we will establish communication (Do-more Designer) to the BRX PLC.